I have a large family and would like to make an 8″ cake. Is there a recipe that I can modify? Hi Beth – use 1 1/2 times the recipe for an 8″ cake if you have an 8 quart pressure cooker. 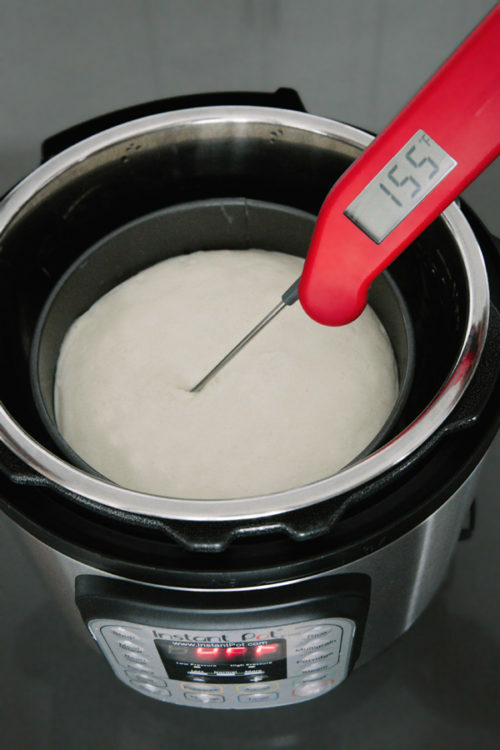 Increase the cook time 10 minutes or until the internal temperature of the cheesecake is 150 degrees. Enjoy! Never mind, I see the other whipping cream measurement! Sorry! Hi Jennifer – I added a heading to the ingredients so it makes it more clear. Enjoy! Hello, I made this cheesecake and it is amazing! I’m planning on making a few for Christmas Eve. Do you have a recipe for the oven? I tried the foil on top of the cheese cake a while ago, it had a lot of water on top. I made this recipe again today, except I put a paper towel over the spring form pan, then I put the foil on top of the paper towel, and made sure the foil was tight on the pan. It came out great and very little water. 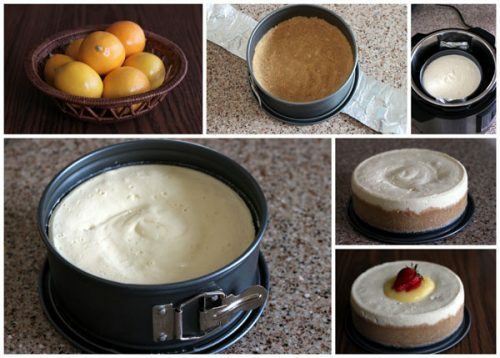 I am sure I have broken a forbidden rule in the world of Instant pot cheese cakes, but it worked! Hi Shelly – although I don’t like making my cheesecake with a paper towel and tin foil, I know a lot of people prefer it that way. If it works well for you, go for it! I have had problems with the paper towel sticking to the cheesecake top and making a mess, and the cook time is longer if you use foil. So I mostly don’t use foil any longer. But I don’t think there’s a right or wrong way to do it. Thanks for sharing! I just made this cheesecake to see how it turns out before taking it to a party. You say that the cheesecake center should be 150 in the center with a instant read thermometer, I followed your recipe 50 min high pressure and 10 min npr, should I adjust the 50 min down or the time for the npr? I forgot to tell you mine was 198 in the center. Hi Angie – you may have gotten a reading from a chocolate chip? You would wait and see how the texture is, if you really like it, then use the same time. If you feel it needed less time, then reduce it. 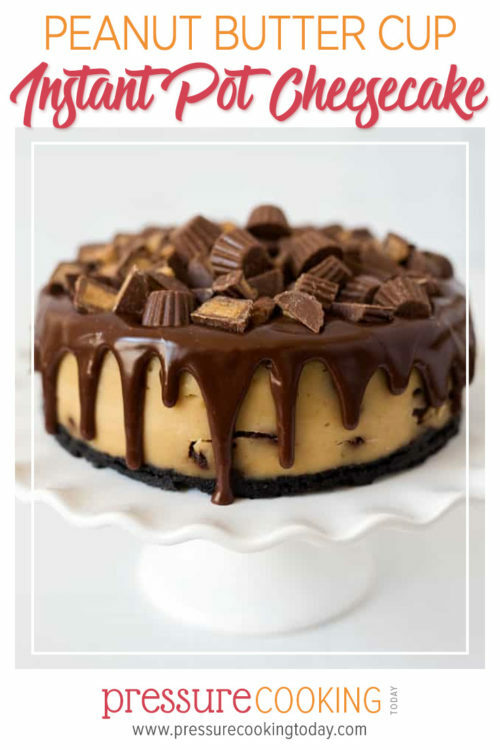 How far in advance can I make this cheesecake? Hi Angie – it’s best if you only make it one or two days before serving. Otherwise the crust gets a bit too soft. Enjoy! OMG. I want this every single day! Fantastic! This is such an amazing holiday dessert! I can’t even tell you how much we love this!!! WOW! I need to get my pressure cooker out and make this ASAP. Looks so good. Can you show a picture of the sling? Hi I just purchased your book The Electric Pressure Cooker Cookbook and can’t wait to try the recipes. 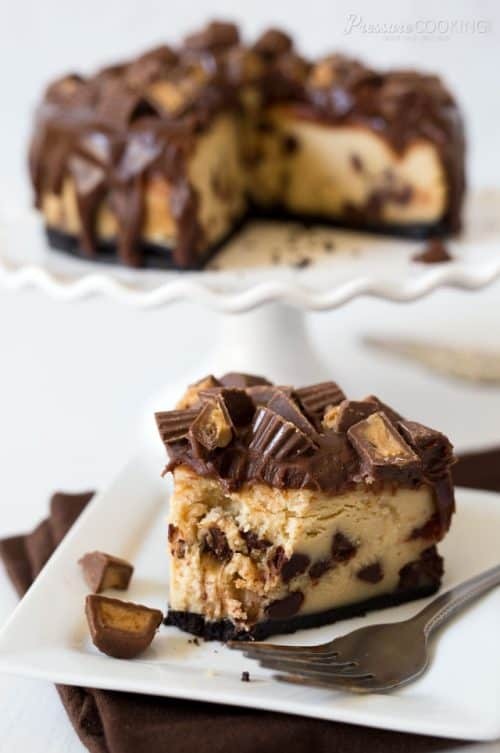 I was glancing through it and I came across your recipe for Peanut Butter Cup Cheesecake…..I ended up googleing the recipe because I was confused the picture has chocolate in the filling and not in the recipe for the filling. When I pulled up the recipe on line yep it says 3/4 cup semisweet Choc. Chips but it is omitted in the cookbook. Hi Angela – thanks for purchasing my cookbook. 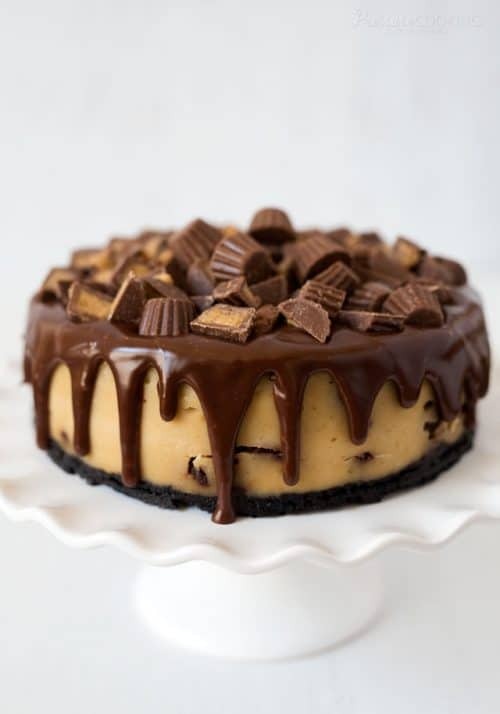 This cheesecake is amazing! Some people commented that chocolate chips in the cheesecake was too much chocolate, so I omitted it in the cookbook recipe. We weren’t initially going to include the picture of this cheesecake in the cookbook but added it last minute. There are some other minor errors in the cookbook listed at the bottom of this post https://www.pressurecookingtoday.com/electric-pressure-cooker-cookbook/ Enjoy! Thanks for the updates in the cookbook. BTW too much chocolate never. I made this cheesecake today. I made the NY style cheesecake #17 recipe 2 weeks ago and it turned out amazing. I can’t wait to taste this one. 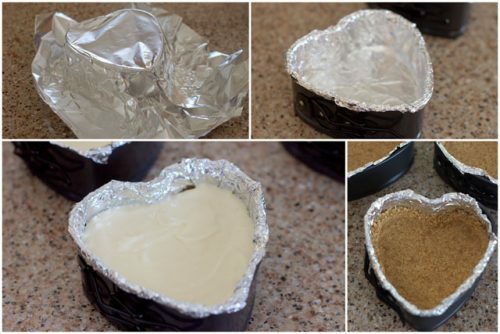 My question is, what’s the reason for covering the top of the cheesecake with foil while it cooks? The other one I made didn’t have me do that and it turned out great. Just curious. 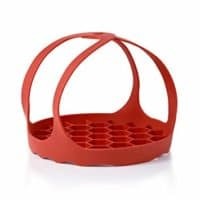 Hi Nicole – covering the cheesecake eliminates water droplets from getting on the top of the cheesecake. In most of my recipes I no longer cover it with foil because it does slow down the cooking. It’s really just a matter of preference. 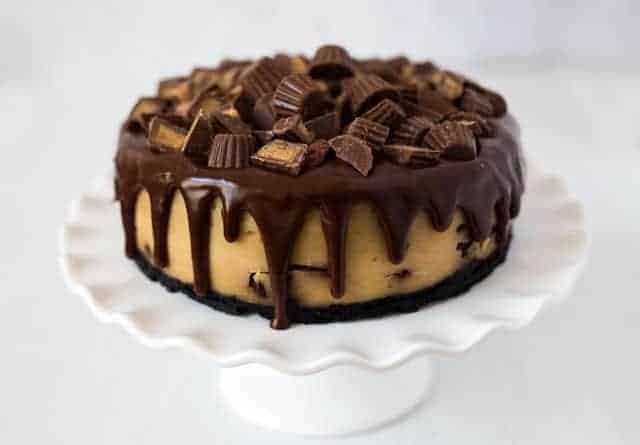 Hope you love this cheesecake! Why does it need to cook 50 minutes asn d the others take 26 minutes? I do not want it yo be dry. Hi Debbie – it needs the extra time because of the addition of peanut butter. Enjoy! Mine came out much, much less tall than the one in your photo. Can I double the recipe? 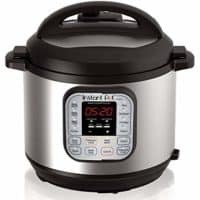 Hi Susan – you can’t double the recipe unless you have an 8 quart pressure cooker and use a larger pan. The chilled cheesecake will be about 2 inches tall. Can you bake the crust for a bit to give it a little more of a crunch? Hi Denise – yes, just let it cool before adding the cheesecake layer. 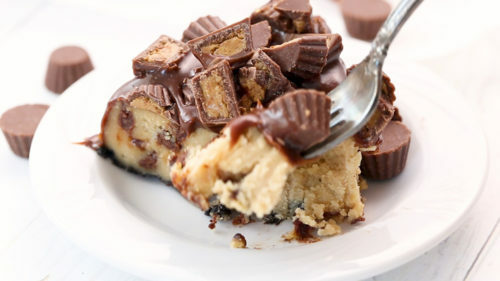 Wld love to make this. 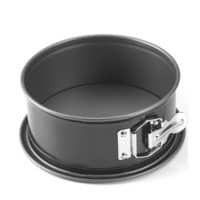 Just got a 7″ springform pan, but it’s only 2″ tall, not 3″. Is 2″ tall enough? 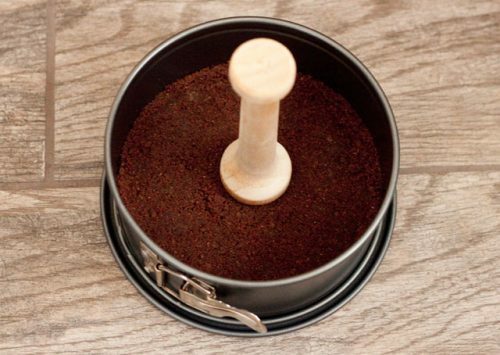 Also, what is the purpose of the sling — if the springform pan is sitting on the trivet inside the IP? Thanks so much. Hi Elaine – yes, it will work fine, just don’t fill the pan more than 2/3’s full. 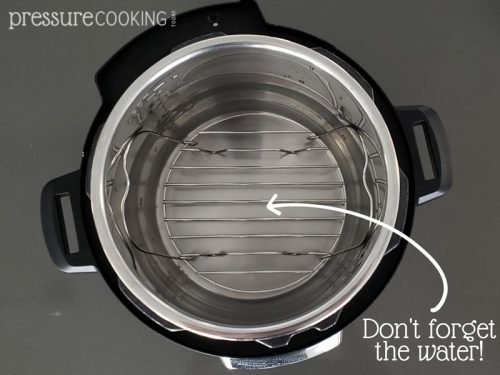 The sling is to get the pan out of the pressure cooker https://www.pressurecookingtoday.com/how-to-get-a-pan-out-of-the-pressure-cooker/ Enjoy!